See something, Say something or Not?! When is it appropriate to see something & say something? When is it ok to not mind your business? We’ve all heard about how it’s advisable to mind your business; to not cross certain boundaries when it comes to infringing on the rights of privacy due to others. I’m trying to ascertain when it would be acceptable to get involved in a situation that has nothing to do with you personally, but everything to do with you morally?! Last night, on a rare night out with the girls, I witnessed someone slip something into an unsuspecting female’s drink. They were dancing with her shortly prior to the incident and she seemed receptive to the frisky advances that they were engaging in on the dance floor. They parted ways after about 10 minutes of dirty dancing. She danced with several other suitors before the one guy approached her from behind and dropped something into her drink which she was holding by the rim, by her side, before walking away. I was standing behind her and saw everything. I had to think fast. I reacted. I “accidentally”, purposely bumped into her, her drink fell. The pill had almost completely dissolved. Naturally she was pissed off. I apologized. She was belligerent. I gave her $10 to buy herself another drink. Needless to say she wasn’t in the right frame of mind to be receptive to the fact that she had been saved from God alone knows what, danger. I posted a status on Facebook about being careful in the bars & clubs, because even though she didn’t sit her drink down unattended, the position that she had it in, she couldn’t see it. I got many comments. From kudos, to I destroyed evidence, to why did that concern me. So that made me think. 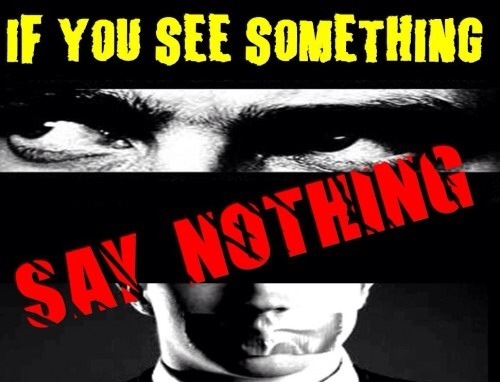 When is it okay to see something, say something?! I’m going to send a message to John Quinones @JohnQABC of ABC’s What would you do. He’s covered this topic before just on a different scenario. Was I right to react?